Jasmine says some people haven't been expecting to hear this message at the shows. She hopes her work with The Polish Ambassador will inspire other artists to speak out for change. David Sugalski, aka The Polish Ambassador, and Ayla Nereo have just wrapped up their cross-country permaculture action tour that brought permaculture education and hands on activism to each city on its route. Successfully crowdfunded in one month, this groundbreaking tour has received overwhelming support from music fans who are ready for their musicians to step up and use their voices for change. The aptly named “impact days” have seen high levels of attendance; on some days volunteers have even worked simultaneously on projects in different locations. At one of the Orlando events, I met Jasmine Fuego, a community organizer and dancer for the tour. In addition to doing her thing on stage, Jasmine was responsible for reaching out to local organizations to get them to come to the shows, educate the audiences on the organizations' work in their communities, and host the impact days where people could come out and do real work in the areas of permaculture, food justice, and sustainability. I sat down with Jasmine and asked her a few questions about the promotion of the tour, the response from fans, and the future of this kind of activism in the music industry. So far it seems that you guys have been getting a very positive response to these impact days that you have been putting together. What kind of reactions have you personally been getting from people about what you guys are doing? How are they responding? So people at the shows are always just super surprised that they came to a nightclub and they’ve now walked into this very interactive classroom. They’re really excited. And those people usually come out to our action days. They’re just so grateful, because it almost seems that people are really hungry for this. They’ve just been waiting for an artist and waiting for, not necessarily a purpose, but just looking for an outlet to— we’re so hungry for community. Obviously for this ecological work and learning how to grow food and regaining our relationship with the land — which is obviously where my heart lies — but I find that in this paradigm we’re living in now, people are really, really hungry for community, and to be a part of a team, and be a part of a common vision to work toward together. And people, when they come out from the shows or when they just come out to the action days, they’re just so grateful to have a place to really connect with like-minded people. Right. An opportunity for that. And you guys are promoting the days at the shows and showing these videos and letting people know what you’re up to actually at the show? Absolutely, yea. At the shows we usually come out and we talk about the tour and who we are. “Who are these people on the stage? You’re not The Polish Ambassador!” I let people know who I am and who we are as a team and what we do, what we specialize in, and then the work that we’ve done. We like to show videos of the action days that we’ve had just to give— cause it’s really hard to imagine. This thing that we’re doing, it’s never been done before, so we like to give them some sort of visual reference to that and we also talk about the action days. We’ve got fliers at the shows, but we also do a lot of internet marketing and we have a Facebook group with a huge following and we’re constantly putting out information about each action day. … Every city we go to, promoters from the music venues are so excited about this permaculture action aspect of the tour that they’re actually willing to promote that, the action days, as well as the show. David said that he wants this tour to encourage other musicians and artists to use these platforms that they’ve developed to inspire social change and activism among their fans. What do you see as the future of music activism after being involved in this project? I see this as being just the standard. I honestly see what we’re doing on this tour as par. Our hope is that all artists see this, they’re seeing the response from this, the fact that not only have we built this network of communities throughout the country, but we’ve sold out— there’s been four shows out of the 28 that we’ve done that we haven’t sold out. So it’s speaking for itself in that way that it’s not really a sacrifice, it’s really just about combining forces. In my opinion and where my vision for all of this is and where my ultimate goal with this first tour is to encourage other artists to come out, and it doesn’t have to be permaculture. Not everyone wants to grow food; not everyone wants to get out in the garden. But to find what it is, what’s your ethos? And make sure that you’re broadcasting that and make sure that you are using that voice and that outreach that you have, or that artists have when they’re in the spotlight to make some sort of stand. It’s not like, “We’re these people and we’re doing this,” but just, “Hey, this is what’s important to me and if you guys are down with that, join me, and if not, if you just want to come to the concert and have a great time, then do that.” I really feel like it’s not necessarily the obligation of an artist; I look at it as an opportunity, because we all have key roles and the key role that artists have is just this huge voice that reaches hundreds of thousands of people. If they can just ignite creation and inspiration in one person to actually do that work, in and of itself, it’s just worth it. "The key role that artists have is just this huge voice that reaches hundreds of thousands of people." I’m really hoping that artists follow suit, and at our shows every night we’re telling people, “Hey! Ask your artists, what do they believe in? Ask your artists, what do they care about? Ask them, what is the message behind their music?” Put them on the spot. It’s an opportunity for them. With David and with all of us, it’s been this amazing way of actually connecting with the audience, and partaking in these dialogues, at the shows, online, at the action days. Let’s build a relationship. Let’s tear down this paradigm of “I’m on the stage above you.” We’re humans, together, working together. What can we do as a community to make this a more inhabitable place for all of us? Wow! 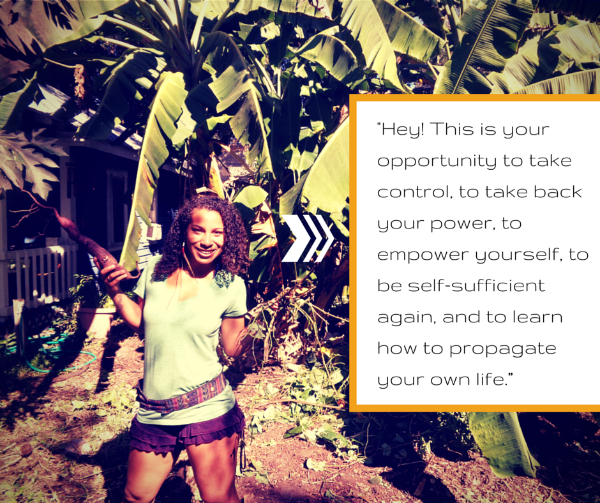 I don’t know about you, but I really believe in Jasmine’s vision and the work she and the rest of the crew have done on this permaculture action tour. I got goosebumps just talking to her about it and I hope to be talking to more artists and organizers who are taking on similar projects in the future. I have seen a few negative reactions to David and Ayla’s decision to attach a message to their tour: some fans have called the information sessions “lectures” and said they take away from the atmosphere of the show. I didn’t make it to the show in Orlando, so I can’t speak about that from experience, but I can say that it is so refreshing to see artists with the ability to sell out venues that are taking a stand for something other than their own profits. Artists stepping up and not just inspiring, but creating the opportunity for others to give back, might be just what this ailing world needs. If that’s the case, I’ll gladly sit through a few information sessions if it means better lives for us all. What do you think about this action tour? Are you happy to see musicians taking on the role of activist, or would you rather keep these messages out of music? Thandiwe Ogbonna is a freelance writer based in Orlando, Florida. She currently writes for The Untz, and has written for DubEra.com, NoDepression.com, and Home Grown Music Network. Tweet to her, @ThandiWay, and tell her about your next great event.